06-Jun-2014 -- From Missoula, I drove northward along US highway 93, with beautiful views of the snow-capped Mission Mountains. At the southern end of Flathead Lake, I turned right to follow the eastern shoreline, continuing past the 48 degree north line of latitude. I then turned right, to approach the confluence point from the north, taking a series of paved roads (that had several nasty potholes!). Northeast of the point, I turned onto a narrow farm road called Chintzey Lane, which I followed until it was blocked by a gate. At this point I was 0.6 miles from the confluence point. I continued on foot, as the remains of Chintzey Lane continued past the gate, through rustic grassland. 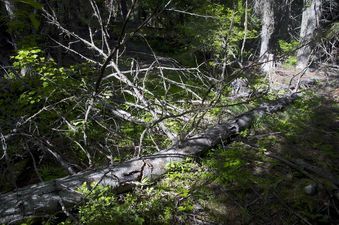 At 0.15 miles from the confluence point, the grassland ended, and my hike turned into a difficult scramble up a very steep, forested slope. (This turned out to be a mistake, as I'll explain below.) The confluence point lay near the top of the slope, in thick forest, and was somewhat of an anti-climax compared to the surrounding area. Just next to the confluence point I saw the remains of a very old road. I returned from the point by following this road to the east. This would have been a much better route to reach the confluence point than the steep, difficult route that I took. So, a recommendation for future visitors: Stay in the grassy area until you reach the edge of the forest at [48.00095,-113.99660]. There you'll see the remains of an old road. Follow this road to the confluence point. #8: A covered bridge, located just off Chintze Lane, about 2/3 mile from the confluence point.